The cold snap this January makes it hard to wake up, our drafty 1961 house never quite warm enough. I’m too cold to relax except when in the shower or in bed. 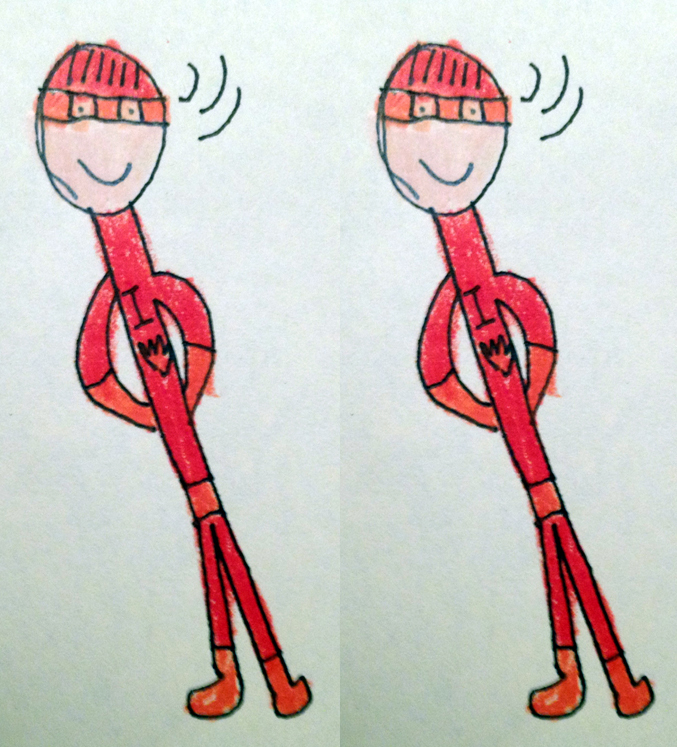 Cold or not, Colin still wakes most mornings at 7:30 A.M.—including weekends and holidays. One morning this week I walk through the dark house thinking everyone, even Colin, could still be asleep. Then he appears in the next room, his blond hair and luminescent skin in the dark startles me at first. He could have been standing there for two seconds or an hour. He’s fully awake, a book in each hand, but all the lights are still out. “Morning, dad,” he says with a hint of impatience as if he has been waiting hours for me, or anyone, to finally wake up. I turn on the kitchen light and he sits down at the table to read. He lets out a long breath. On good mornings Colin is so calm and composed, I wonder how I can ever lose patience with this angelic boy like I had the previous night when I asked him for the twentieth time to brush his teeth. For the next 15 minutes it is just the two of us in the kitchen. I toast frozen waffles made edible with peanut butter and warm maple syrup. I pour him orange juice to wash down the nutritional supplements he takes every morning and night. He holds a book open with one hand and forks pieces of waffle with the other. I put away a few dishes, put out kibble and fresh water for Emi the dog, take a lunch Maura made for me the night before and set it by the front door so I won’t forget it. I give Colin a blanket, pulling it down over his legs. I toast him another waffle. We don’t talk much, but when I look over at him from across the room, he’s watching me. He has put aside his book and has a pen in hand and a stack of blue 3×5 index cards. 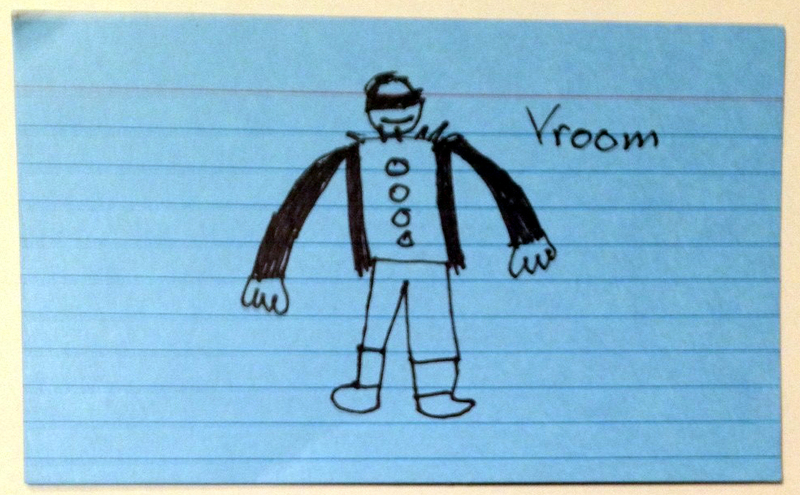 He draws cartoon figures on the blue index cards. As soon as he finishes one, he carries it over to me while I work at the sink. The first card shows me in a leather jacket, he says, with my morning superhero mask on. 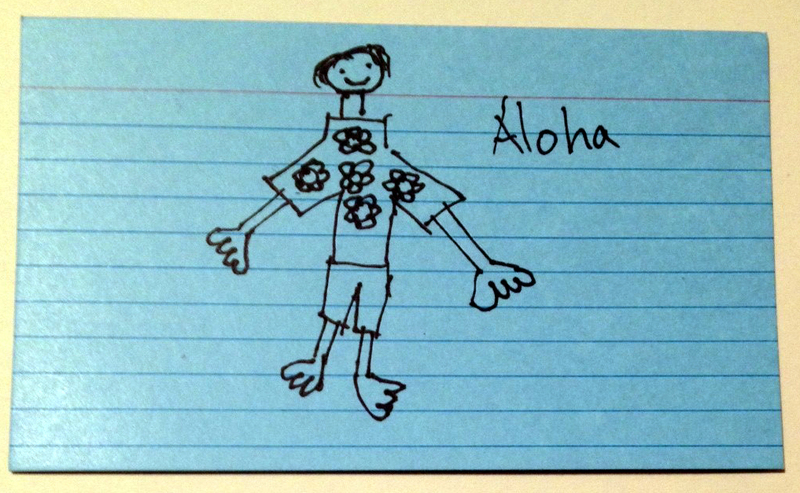 In the next, I wear an Aloha shirt and shorts. Then I’m asleep on the bed with hairy arms and legs—lazy! 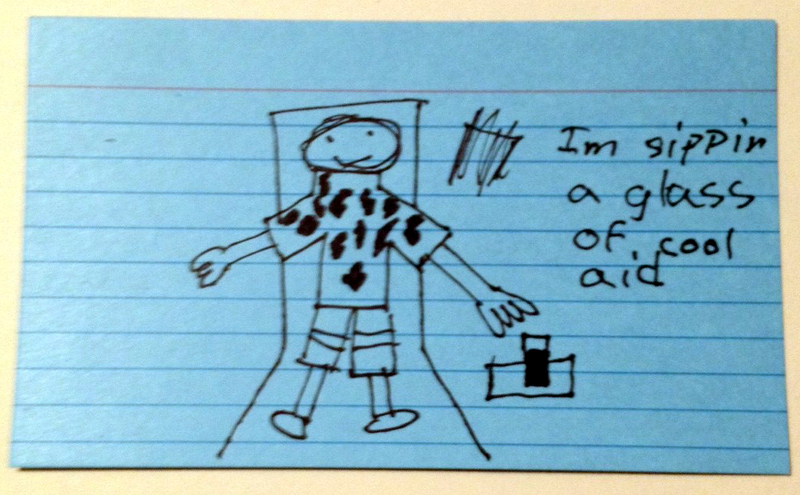 Other cards show a girl he admires at school, a self portrait in a lawn chair with a glass of “cool aid” at his elbow, and finally a series of treasure maps. And so the tranquil morning goes. It happens more than you would think. The next morning we all wake late, even Colin. I put on music in the living room to gently rouse the boys, but they hunker down under their covers and pretend to sleep. Maura and I hurry about getting cereal poured and toast toasted, feed Emi the dog, letting her out and back in. Maura lays out school clothes on the boy’s beds. Colin finally wakes up, but we can’t convince him to put the clothes on. Instead he wanders into the kitchen in his underwear with a pile of books in his arms. This is the way it goes with Colin. But he shows up in the kitchen in his underwear. No shirt. No socks. And no pants in sight! I hand him his socks and he lets one drop. He stares at the floor. I raise my voice. I can feel it coming and can’t stop it. “Get going! How can you just stand there!” He drops the other sock. I take his head in my hands and tilt his face up to look me in the eye. “Get moving!” He pulls away, folds his arms over his chest tight, and starts to cry, face flushed with indignation—the real thing. I’m not exactly talking in my “inside” voice myself. I retreat again. Maura comes in to take over. This time I retreat outside to heat up both cars, as I usually do on cold mornings. I start my car and accidentally lock the door. Back in the house for Maura’s spare keys. Back out to start Maura’s car. The battery is dead. I see the back seat reading light has been on all night. Most nights I check for these lights and about half the time I find at least one still on and the doors unlocked. For some reason, I feel like I have to open the door to announce this, as if saying it with enough contempt could change things. Then I’m outside again. I pull my car up alongside Maura’s. It takes several tries to get the front of my car close enough so the jumper cables will reach. The tires spin on the ice and I slip when I get out of the car. So I grab the near empty bag of salt and upend it, pouring what little is left in one spot, and toss the bag aside. I slip again. I have two sets of jumper cables tangled together and I wrench one free, putting the other set on top of the recycle bin. The cables slip off. I pick them up. They slip off again. I kick them aside. My hands now numb with cold, I unhook the hood latch to my car with difficulty and remember, when I finally get it open, that the lever to hold the hood up is broken. I let the hood drop hard. Back through the house, where the kids still aren’t fully dressed, into the backyard, through the snow, to retrieve a small shovel I use to prop open my broken hood. Back through the house with wet shoes. The hood latch won’t open until I push it shut again and reach inside the driver’s side to release the latch. While doing this, I drop the shovel. I open the hood again, holding it up with my left hand and reach down for the shovel. I can’t reach it. Repeat the previous three sentences. I open the hood for the third time with shovel in hand and prop it open. I attach the re-tangled jumper cables to my battery and try to untangle the two live ends. A spray of sparks! I finally attach the cables and start Maura’s car. At this point the neighbor girl, who is Colin’s age and rides to school with us every morning, arrives. She’s bundled up in sweater, coat, gloves, scarf, and knit hat, her backpack strapped so tight I wonder how she can breathe. “The usual,” I tell her. I’m certain she knows exactly what’s going on and how I feel about it. After all, this isn’t her first morning at our house. She smiles up at me through her glasses, a bit fogged from the cold, and goes into the house. I touch the live cable ends together again while unhooking them. Another spray of sparks! I do a little dance on the ice, live cables in hand, until I get my footing. I’m not making this up. It’s more like a scene in a Charlie Chaplin movie than a moment in a real fool’s real life. With both cars now running, cables stowed, hoods re-latched, I go back in the house for my brief case. The neighbor girl is sitting on the floor next to Emi the dog. She has her head in her hands and looks like she’d rather be anywhere else. Our boys are still struggling with their winter coats—sleeves inside out, zippers stuck. Maura loads finished homework and sack lunches into their backpacks. Everyone fusses and stomps around the front door. I tell the neighbor girl she can get in the car if she wants, “we’re almost ready.” Emi the dog escapes when she opens the door. I find my brief case in the back bedroom but can’t find my cell phone. The struggle continues in the next room. Then all at once it is me holding things up. The boys clamor out the door. Emi the dog is inside the car jumping back and forth between the front and rear seats. The neighbor girl is tittering over the front seat trying to reach the knob to turn on the heater, which I had forgotten to do. A few more beats of chaos as the boys slip their way across the ice and exchange shoves. Emi the dog escapes the car, makes a blinding, open mouthed circuit of the front yard, and jumps back in. Maura and the boys pull out of the driveway, off to school with just enough time to beat the tardy bell. And I’m in my car turning on the radio, off to work for another ordinary day. 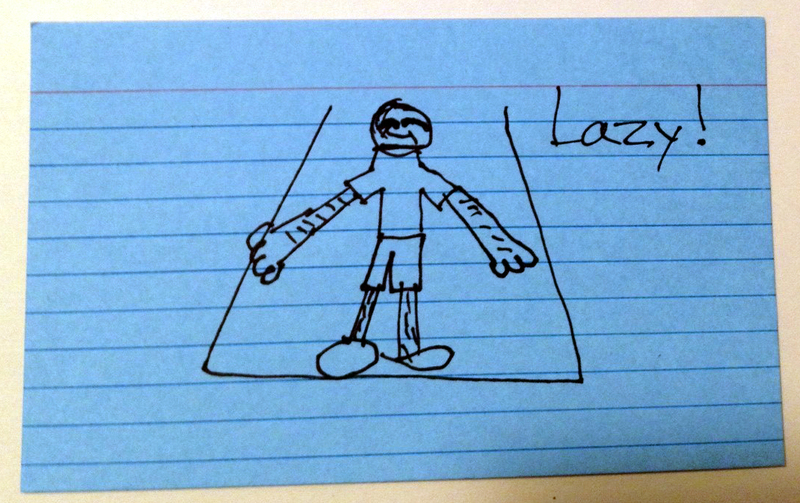 This entry was posted in Field Notes and tagged "autism, cartoons, drawings, Emi the dog, mind blindness, morning rituals, Quinn, superheros, tantrums. Bookmark the permalink. OMG. I am exhausted and overwhelmed reading this. I have no kids. I am exhausted just by my normal life, let alone wrangling an entire family. The drawings are so lovely! Be sure to keep them somewhere safe. I have one, done on a napkin, by my half-brother when he was about seven. He’s now 32 (and no longer speaks to me.) I still treasure the drawing. You’re really good at writing. I never thought non-fiction could be so interesting.